One in four older Americans falls every year. Falls are the leading cause of injuries for seniors aged 65 and older, so preventing falls can be vital to their overall health. According to the Centers for Disease Control and Prevention (CDC), one out of five falls causes a serious injury, such as broken bones, hip fractures or head injuries. And each year, at least 300,000 older people are hospitalized for hip fractures. Balance and gait – As we age and become less active, we can lose some coordination, flexibility, and balance, which can cause instability. Vision – As we get older, less light reaches our retina, which makes contrasting edges, tripping hazards and other obstacles more difficult to see. Medications – Some prescriptions and over-the-counter medications can cause dizziness, dehydration or drowsiness, which can all lead to a fall. Environment – Seniors who have lived in their homes for a long time may not think about simple changes they can make to their space to keep it safer as they age. 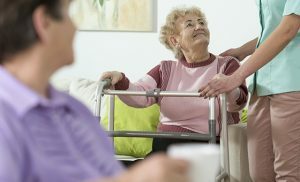 Now that you know the risks, here are 4 things you can do for preventing falls so that your loved one stays safe and that you have peace of mind. Is your older loved one unsteady on their feet? See if they’re holding onto walls, furniture or someone else when walking, or if they seem to have difficulty getting up from a chair. They may need help improving their balance, strength and gait. A cane, walker or other mobility aid might be the answer. But oftentimes light exercise and regular activity can improve overall stability. Is your older loved having trouble managing their own health? Make sure they are remembering to take their medications, and ask if they are experiencing side effects from that medication. Are they having difficulty doing routine daily tasks or do they have other health concerns? If certain health issues are not addressed immediately, it could lead to more serious problems down the road. If your parent or grandparent wears glasses, do they have a current prescription? If not, it may be time for an eye exam. Also make sure they are using the glasses as directed by their eye doctor. Remember that sometimes tint-changing lenses can be hazardous when going from bright sunlight to the indoors. And bifocals can be problematic on stairs and other level changes in the home. Pick up anything on the floor that they could trip over, including unnecessary clutter. Consider moving anything that is plugged in to a different area of the home if the cords become a tripping hazard. Make sure their home has enough light by adding more or brighter light bulbs. At FirstLight, we help seniors enjoy the best quality of life for as long as possible. Contact FirstLight Home Care to learn more about our senior home care solutions that help keep your loved one safe, healthy and independent.